Rafiqun Nabi, also known as Ranabi, born in 1943. He is a Bangladeshi artist and cartoonist. Nabi's most famous creation is Tokai, a character symbolizing the poor street boys of Dhaka who lives on picking things from dustbins or begging and having a knack of telling simple yet painful truths about current political and socio-economic situation of the country. He has written few stories in Prothom Alo newspaper of Bangladesh. 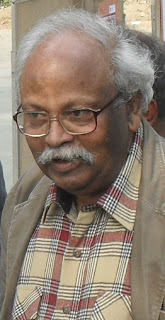 Nabi was born in Nawabganj District in northwest Bangladesh in 1943. He graduated from Pogose School, Dhaka. He enrolled in the Bangladesh College of Arts and Crafts (later renamed as Institute of Fine Arts under Dhaka University). There, he studied under the supervision of artists like Zainul Abedin and Quamrul Hassan. Nabi received a scholarship from the Asia Foundation between 1962-64. After his graduation, he joined the institute as a faculty. He went to Athens and studied art between 1973-1976 under a scholarship from the Government of Greece.